I teach health economics to medical professionals and every year many of them say they perceive greater moral hazard among Medicaid recipients than among the rest of us. I think this perception is partly due to the way the economics profession has influenced our thinking in mmutilitarian ways. All the research I have been able to find about the matter indicates that Medicaid clearly increases health expenditures less than private insurance does and I can’t see any clear evidence that Medicaid recipients use a different amount of services than people with private insurance. Unfortunately I haven’t found much solid research on the matter. If you see any that I missed, please leave a comment. One study in the Journal of Health Economics found no moral hazard in nursing home care when Medicaid is more generous than when it is stingy. Another study in Inquiry, found that health care spending is significantly lower under Medicaid than under private insurance due to lower provider payment rates and found little difference in services used. A paper in the American Journal of Public Health found that children on Medicaid get less physician visits than privately insured children although both get more than uninsured children. The only place I have found any evidence of greater moral hazard among Medicaid recipients is in a HSC Research Brief that suggests Medicaid recipients use about the same number of Emergency Room (ER) visits as people with private insurance, but it might show a bit more moral hazard here. In the figure below, the only category of care that the ER has judged might be moral hazard is the non-urgent care because this does not require care within 2 hours and so is not worthy of being called an emergency. 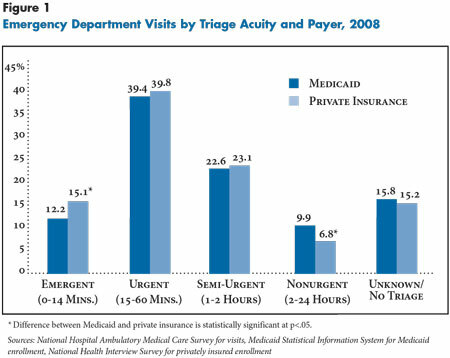 Some of it is probably wasteful moral hazard, but most non-urgent care is not wasteful. I have been forced to go to an ER when my child needed antibiotics on a Friday night and there was no alternative until Monday morning, 60 long hours later. My kids always seem to get sick and have accidents on weekends and evenings when there are no office hours and I get stuck with ER bills. Fortunately, our problems have rarely been urgently life-threatening, and we usually have had to wait because other patients were more urgent. Nobody wants to sit around in an ER on a weekend for frivolous fun. Medicaid recipients are more concentrated in poor regions with less access to convenient doctor office hours and that could explain some of their reliance on emergency room visits for non-urgent care. Forty-five percent sounds like a huge percentage increase, but compared to the total amount of ER care, it is insignificant. Medicaid recipients only get 3 percentage points more non-urgent care than people with private insurance so if all the extra non-urgent care were eliminated, there would only be 3% fewer ER visits for Medicare patients. And non-urgent care is the very cheapest kind of ER care so the dollars lost are probably much less than one percent of total ER expenditure. In healthcare, 20% of patients typically account for at least 80% of the spending and non-urgent care is the very cheapest kind of care. A few expensive urgent ER patients probably cost almost all of the money. People with private insurance get greater care in all the more urgent categories that cost more money because private insurance pays more generously. There are several studies that show that Medicaid patients get inferior care partly because doctors prioritize patients with higher payments. But the number of non-urgent patients sometimes looks overwhelming if you look around in any busy ER because the non-urgent care is triaged, so non-urgent patients have to wait. A busy ER typically has many non-urgent patients impatiently waiting in various waiting areas until the ER doctors have the free time to deal with them. That will make them much more visible than the urgent care that gets dealt with immediately and moves on. Even though non-urgent ER patients are less than 10% of the people coming into the ER, they might make up more than 50% of the patients who are present in the ER because they have to wait longer. In my experience in Chicago, I typically had to wait 2-8 hours to complete a brief visit with an ER doctor. I’m surprised that Medicaid doesn’t account for a much bigger amount of ER patients. Many Americans first get signed up for Medicaid by an ER because that is where uninsured people tend to go. The ER is currently the universal health care system for all uninsured people in America. President Reagan signed the EMTALA act in 1986 which was the first guarantee of universal healthcare for all people in America without regard to ability to pay. Anyone can go to an American ER and be guaranteed of getting all the care that is medically necessary that a hospital can provide. Hospitals have a big incentive to sign up these patients for Medicaid whenever possible. The US healthcare system does rely excessively on ER care, but that is not due to the moral hazard of insurance. It is because our system has a shortage of primary-care physicians which creates a shortage of regular office hours and our system has too many uninsured people whose primary access to care is through an ER via their EMTALA ‘insurance’. It seems like it must be inefficient to have such differences in ER usage. Many American economists are obsessed with the idea that the moral hazard of patients is the most wasteful part of the US healthcare system, but that is wrong. I have never seen statistical evidence that moral hazard are a significant problem in America, particularly when compared with over-treatment by providers or even our huge administrative costs. For example, more generous insurance coverage is supposed to produce moral hazard, but that can’t explain any of the differences in ER utilization shown on the above map. This data seems to confirm that the moral hazard of Medicaid is not very important in the big picture. Neither Medicaid recipients nor patients with private insurance use much frivolous, ER resources compared with the total volume of care, and in dollars spent, it is trivial. And remember, even much of the non-urgent care is not frivolous. Much is useful care that just happens to be outside of office hours. It isn’t completely clear if any of this non-urgent care is wasteful moral hazard, but even if all non-urgent care were waste, it would not be anywhere near the biggest source of waste in our ER system. Economists like Mark Pauly who focus on ‘moral’ hazard are usually using a warped mmulilitarian ethical system which defines morality according to ability to pay. According to this version of the theory, insurance should never cause anyone to spend more on healthcare than they would spend without insurance. Any expenditures that a patient would not pay out of pocket is moral hazard. Under this definition of moral hazard, poor people are always more guilty of moral hazard than wealthier people because poor people have lower ability to pay than wealthy people. But the whole point of health insurance is to increase your ability to pay if you get a mortal illness and need more money to survive. People who are wealthy enough to pay for any possible health problem out-of-pocket have little need for insurance. Insurance is the most useful when the ability to pay for healthcare could make a life-or-death difference. This warped morality underlying ‘moral’ hazard explains why economists like Mark Pauly see greater moral hazard in insurance for poor people like Medicaid than in insurance for the rest of us. Under the ‘moral’ hazard view, elites like Bill Gates should be able to get whatever they can afford, (whether insurance pays or not) but healthcare should be rationed for the middle classes and healthcare for the poorest people is pure moral hazard that should be eliminated. According to the ‘moral’ hazard view, a billionaire alcoholic who burns through liver transplant after liver transplant at boutique, black-market hospitals is exercising his consumer sovereignty and efficiently maximizing consumer surplus whereas a homeless guy who gets a lifesaving $10 antibiotic at an ER is squandering society’s resources because his life is worth less than $10 if he isn’t willing to pay that much to save it. The wealthy cost more partly because they live in more expensive areas, but it is also because the wealthy simply demand more treatments and more expensive treatments. Wealthy people get more healthcare, but they don’t need more. They should need less because wealthy people are healthier and live longer than the median American. I suspect that nobody complains about the moral hazard of the wealthy because the warped mmutilitarian ethics that underlies moral hazard theory judges that wealthy people deserve more medical care than the rest of us. Although there is some wasteful treatment under every kind of insurance, doctors have more incentive to provide generous treatments to patients with private insurance than to Medicaid recipients. This is because Medicaid reimburses much less generously than any other form of insurance, so providers have more to gain from over prescribing for people with private insurance than for Medicaid patients. Medicaid patients are so much less profitable that over 30% of doctors refuse to even see new Medicaid patients. That is a lot less potential for moral hazard. Medicaid is the cheapest insurance because it pays lower prices than any other insurance in America which holds down expenditures and gives doctors an incentive to prescribe fewer services than for patients with any other kind of insurance. Physicians have a bigger responsibility for healthcare costs than patients because physicians control most medical expenditures. Patients simply cannot get anything more than a basic appointment without a doctors approval and simple appointments are relatively cheap compared with a surgery or MRI. That is why over-treatment caused by supplier-induced demand is a much bigger problem in the US than the moral hazard of patients. Even if Medicaid patients did try to ask for more treatment than wealthier patients (which is contrary to available evidence), the fact that Medicaid pays poorly means that doctors are much more reluctant to go along with frivolous treatments. In reality, only mentally ill people want more medical treatment than the absolute minimum. Psychologists diagnose people who want excessive medical care as having Munchausen syndrome, hypochondriasis, somatic symptom disorder, or factitious disorder imposed on another. The economists who accuse nearly everyone, but mostly people below median income) of moral hazard are actually diagnosing the public of suffering from an epidemic of these psychiatric disorders. I haven’t found any statistical evidence to support the stereotype that there is more wasteful treatment among Medicaid recipients than anyone else, but please leave a comment if you see any research that has any bearing on this question. UPDATE: A new paper found that, “The uninsured do not use the emergency department more—they use other care less.” However, the study also showed that people on public insurance (such as Medicaid) do go to the ER more than the other two groups (29.3% vs. 11-12%), so perhaps the free care in the ER does create higher demand! But it didn’t show whether that care was more useful or wasteful and that should be the real test of moral hazard.